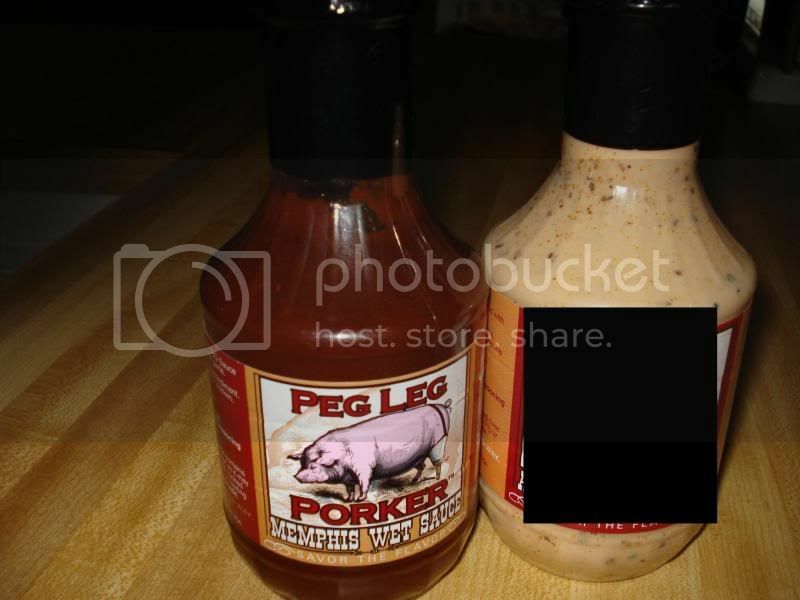 First of all, can we go ahead and agree that this is the best label on a barbecue sauce ever? Yes, those are a bunch of pigs laid out in a row being mopped by a smiling gentleman in a chef's hat, and there are five more pigs hanging up behind them. Phenomenal. C.F. 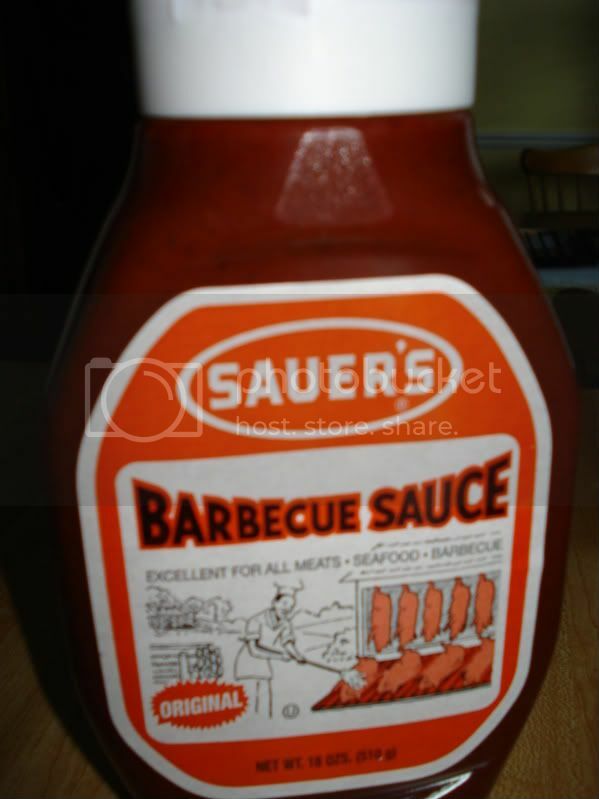 Sauer Co. began in Richmond, Virginia in 1887 by selling flavoring extracts and spices. Over the years, the company has expanded and absorbed other companies, including cult favorite Duke's Mayonnaise, and now offers a variety of products, including barbecue sauce. 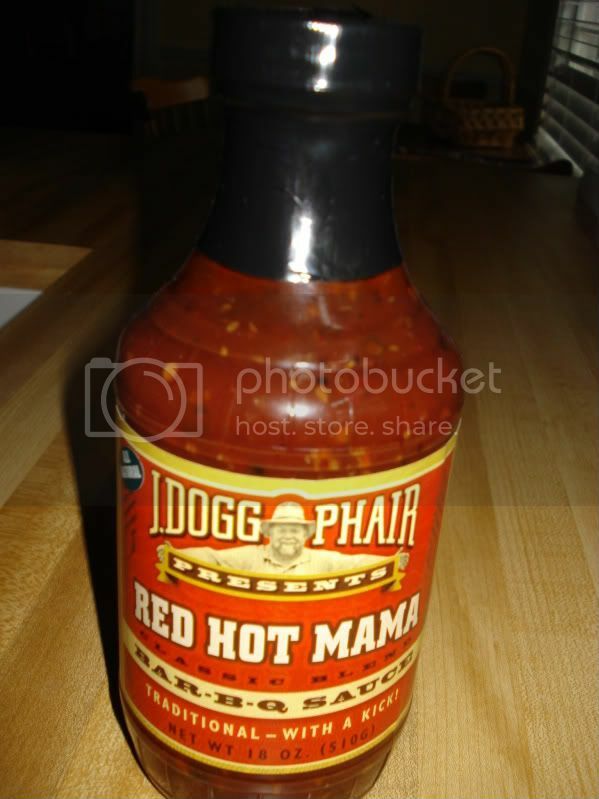 The sauce is a rich red color, flecked with lots of spices, and is of medium thickness and smooth texture. It comes in a unique squeezable bottle with a squirt top. The flavor of this sauce is a marvellous cocktail of tangy and spicy. There is just enough sweetness to take a little bit of the bite out the vinegar, but make no mistake - this is not a sweet sauce. Not surprisingly from a company who traffics in the stuff, what sets this sauce apart is its unique blend of spices. It's hard to tell exactly what's going on, but it's unique and it's delicious. I have really been digging on some Drew's Brews coffee lately. This locally roasted coffee is top notch. Drew Park really knows his stuff and he continues to churn out some of the best beans you can possible buy. The latest blend in my coffee maker has been Off The Grid, a blended formulated exclusively for the local coffee shop Crema. 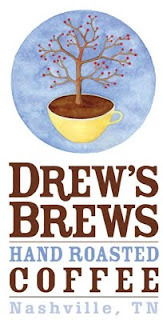 If you haven't tried Drew's Brews you are really missing out. You can pick some up locally at Crema or Whole Foods. 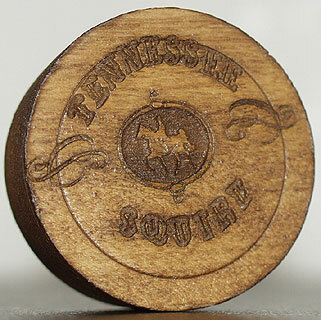 For those outside of the Nashville area, you can order it online. For this edition, we are headed up to Robertson County, where, as it turns out, dark fire tobacco is not the only thing that they're good at smoking. We begin in Cross Plains, Tennessee (home of the annual Trash & Treasures community yard sale every year in June) at True's Barbeque, where there are plenty of trash and treasures on display throughout the restaurant. True's serves a fine barbecue sandwich. As you can see, the bun is overflowing with pulled pork. The pork is tender and juicy, perhaps bordering on mushy, with just a hint of smoke and a little bit of pre-applied vinegar-based sauce. I found this sandwich design to be a trend in the Robertson County BBQ joints - pulled or chopped pork with a light application of vinegar-based sauce before serving, and vinegar-based sauce on the side. There were no tomato-based sauces to be found 'round here! Mike's Old Fashion Bar-B-Q in Cedar Hill is about as close as you can get to the middle of nowhere. Located in a small pre-fab building at the fork of Highway 41 and Dunn Road, Mike's is only open Thursday, Friday and Saturday. The small ordering area is filled with tobacco-related memorabilia. The barbecue sandwich contains plentiful pulled pork that is really tender without being mushy. There are ample bits of chewy bark mixed in. The whole business has been treated with a vinegar-based sauce that is a nice complement to the lightly smoky flavor of the pork. Overall, another really good sandwich. Mike's is the only local barbecue place in Robertson County that serves ribs. These ribs were very disappointing. Little to no seasoning was evident at all, resulting in a bland flavor. Texture was off the mark, too, as the ribs were very tough. J.I. Baldwin & Son Barbecue, which allegedly has been open since 1926, is located right in the heart of Springfield, which is the county seat. As I'm coming to expect in these parts, Baldwin serves up a mean sandwich. This time, the pork is chopped, but it is still exceptionally tender and juicy. It's not quite as smoky as the other sandwiches in this report, but still has the complement of vinegar-based sauce. And the hot vinegar-based sauce that's available on the side packs quite a punch. The place that I was most curious about in Robertson County was also the one I was most doubtful about actually finding still in existence. One of the first barbecue-related books I discovered was Real Barbecue by Greg Johnson and Vince Staten. In that book, published in 1988, Johnson and Staten put forth a list of the 100 best barbecue restaurants in America. That list was surely controversial then and it still is today, but the one and only barbecue joint from Middle Tennessee to make the list was Old Fashion Bar-B-Q in Greenbrier. The barbecue was cooked by Thomas Jones as a weekend-only side business and vended out of an old milk truck in his front yard. Johnson and Staten gave it their highest rating - "As Good As We've Ever Had." Fast forward to 2009 and I am scouting barbecue restaurants in Robertson County. Of course I want to hit Old Fashion if I can, but the chances of it still existing are slim. First of all, it's been 20+ years since the book was written. Barbecue restaurants seem to age in dog years. It's a rarity for one to last that long, especially a mom-and-pop weekend-only operation based out of someone's home. Second, I could find no indication on the internet that this place is still open. 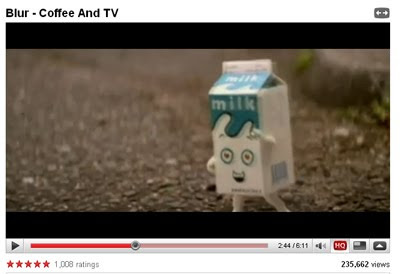 I mean there is ZERO reference to this place online - no restaurant listings, no mention in blogs, nothing. Finally, the address given in the book - "335 Hwy 431" - does not exist according to my GPS device. But I thought I'd take a cruise down 431 and see what I could see. Well, imagine my surprise and excitement when I saw this sign on the side of the road several miles outside of Springfield. There was no old milk truck, but there was a little hut beside the house with a little pig on the door (and a Visa/Mastercard logo). Soon after I pulled in, a nice older lady emerged from the house and asked if I was there to buy barbecue. I said yes ma'am I am. She went into the side door of the hut and I went into the front door. Inside, separated by a thin screen, we transacted business. Three dollars for a barbecue sandwich. Pork shoulder is the only item on the menu here. "Hot or mild?" she asked. I ordered the hot, and while she was assembling the sandwich, I perused a framed clipping about the place from the Nashville Banner in 1989. After receiving my foil-wrapped sandwich a minute later, I was on my way. The resulting sandwich was not mind-blowing, but it was very, very good. It was tender as could be without being mushy, and the flavor was fantastic. It had greater than average smoke flavor (most likely hickory) and was perfectly seasoned. The chopped pork texture was studded with lots of crispy black bark pieces. The sauce was a tangy and spicy vinegar-based concoction. If I had one complaint, it would be the bun, which was kind of rigid and didn't do a great job of melding with the meat and sauce. Overall, a most excellent barbecue sandwich. Obviously, somebody else is eating them, because this place has now been in business for 20+ years. Greenbrier residents must just be very good at keeping a secret, I guess, because I have heard no mention of this place at all through the years. If you want to visit, the actual address is 1784 Tom Austin Highway; Greenbrier, TN 37073. It's just north of Pebble Brook Estates / Golf Course. They are open Fridays and Saturdays only from 9AM till dark or until they run out. This is another remnant of our Memphis in May experience. One of the highlights of the weekend was the Peg Leg Porker party on Thursday night. 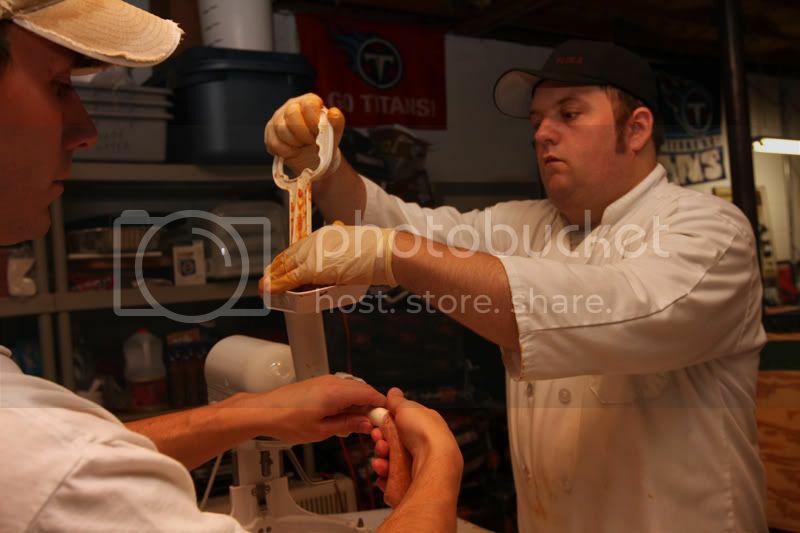 Among the teammates and partygoers hanging out were some of the finest chefs in Nashville - Tandy Wilson, Hal Holden-Bache, and Tyler Brown, as well as Pat Martin of Martin's Barbeque Joint fame. We had a great time and met so many great people and had so much incredible food and drink. And we got a couple bottles of barbecue sauce, too (the Alabama White Sauce unfortunately did not survive). The Memphis Wet Sauce is tomato-based, but it doesn't skimp on the vinegar either. Unlike so many tomato-based sauces, this one is not too sweet. It allows the natural sweetness of the tomatoes to shine, balancing it with the tanginess of the vinegar. But what really makes this sauce unique is the interesting blend of spices which are suspended throughout. Warm and rugged flavors like chili powder, cumin, and cayenne pepper give the sauce a taste of the Southwest. But there's no mistaking it for anything but barbecue sauce. Overall, a very unique and very tasty sauce. 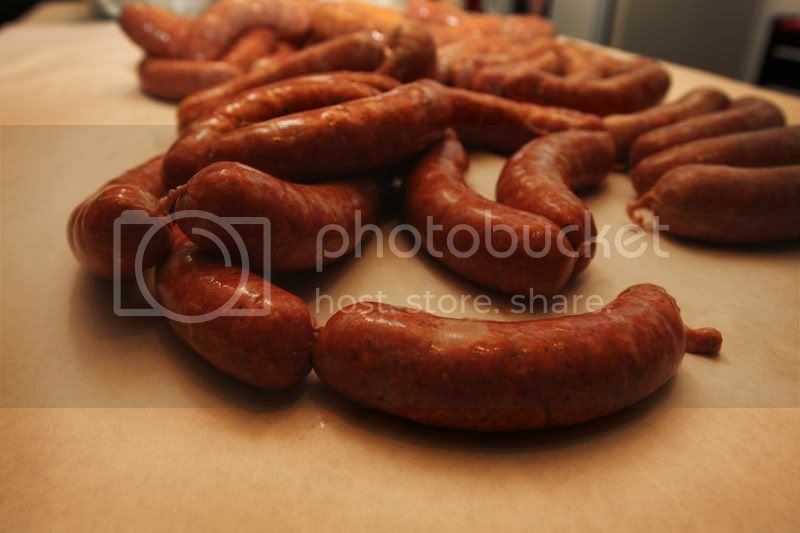 Here are some pictures from my first sausage making experience. 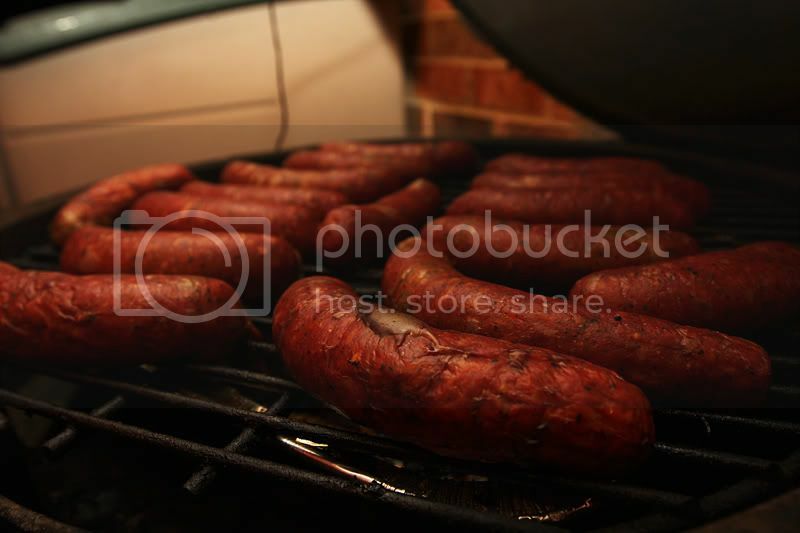 I went with a Texas Hot Link 70/30 pork to beef ratio and added some jalapenos. It was pretty tasty for the first attempt. Luckily Alfred (master butcher) was available to lend a hand. I also want to thank Chez for helping me get started. I was very excited when I recently spotted a brand spankin' new banner for a pizza parlor that I'd never heard of: Geadello's Pizza. Yes that's right - a banner - it's not even old enough to have a permanent sign up yet! The business cards are printed, but it may be a bit early to have provided that web address. Geadello's isn't entirely new though - just new in the realm of a neighborhood pizza shop. Geadello's has been operating as a catering company for several years in the area, offering pizzas for parties, events and corporate gatherings. Starting with a modest menu of pizzas, subs, calzones and chicken wings, Geadello's offers hand-tossed pizzas in three sizes (small, medium and large) with all of the traditional topping options from pepperoni to mushrooms. 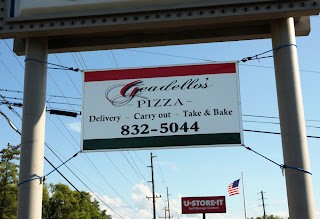 There are only delivery and carry out options available as Geadello's has no dining room (the guest pickup room wasn't really even ready). But owner Joe LoCasto is friendly, flexible and works quickly. 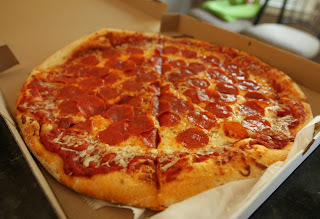 I popped in on the way home from "work" one afternoon, placed my order and in no time I was carrying out a piping hot large pepperoni and cheese pizza (that only cost me $11.00). The thin, New York-style pie had a soft, floury crust that was without any outstanding notable flavors, but very good in its plainness with a great texture. There were occasional spots of powdery flour on the base, but sometimes that's just there to let you know that its handmade. The thick tomato sauce was a on the medium side in terms of spiciness, and despite the visible seasonings, the flavor was pretty average as well. The cheese and pepperoni, however, were outstanding. The mozzarella was fresh, gooey and great. I could have used a little more towards the edges though (which would have improved a low pull away score). 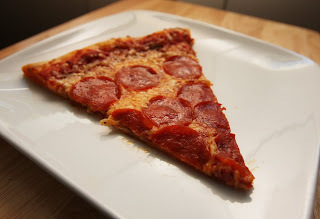 The pepperoni was equally fresh and delicious - spicy and a little tangy as well. These two worked together beautifully in terms of taste, but they created quite a bit of grease. The blot was required. Overall, it was a pretty darn good carry-out pizza, made to order with fresh ingredients. Simple, but tasty. Good luck Geadello's and welcome to the neighborhood! To all those folks out there with a competitive spirit, you need to get signed up for the Bacon Takedown. This Throwdown errr... Takedown will take place at Aerial in downtown Nashville on September 13th. So all of you that experiment with bacon recipes at home need to show us what you are really made of. Get signed up and lets see how your bacon recipe stacks up. Today is the day. At 1 o'clock today the bungs will be drawn to see who makes it into the Jack Daniels Invitational. Check out Pellet Envy's blog for a list of the eligible teams. Good Luck to all and we will see you in October.